You will find in the project list several options to find a project you are looking for. This chapter will introduce you to the search function, the use of views and filters when searching a project in InLoox PM 7. 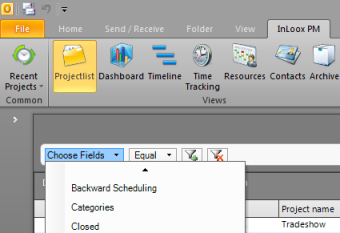 Click Project list on the Outlook Ribbon to switch to the InLoox PM project list. In Outlook 2003/2007, click InLoox PM Folder in the InLoox PM Toolbar. Click the tab InLoox PM and then More Views, in the Views group. All saved views are displayed by default. Choose one view from the list, e.g. Projects: project manager view. You will see an overview of all projects to which you are assigned as project manager. For more information on how to save a view, see Create a view. The filter row is available above the project list . Once you have selected a field (e.g. Category or Closed) and a filter operator (e.g. Equal or Contains), you can enter a text in the field behind the filter operator, e.g. marketing and press Enter. If you don't see the filter row then it was hidden. Right-click and choose in the context menu Show filter in order to display it. How to Use the Search Function in the InLoox PM 7 Project List • Copyright 1999-2019 © InLoox, Inc. All rights reserved.